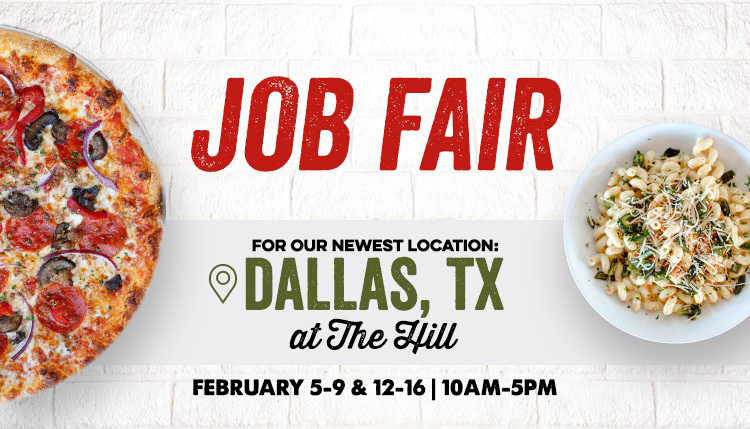 Sauce Pizza & Wine is currently hiring for our newest location in Dallas, Texas! We’re looking for energetic, service-minded individuals who are committed to providing exceptional guest-satisfaction in a fast paced, high-energy environment. If this sounds like you, then our Sauce family would love to meet you! As an early pioneer of combining a fast-casual experience with high-quality food and service, Sauce Pizza & Wine—founded in 2003—reinvented Italian dining. Sauce’s specialty is catering to people of all ages with artisanal, farm-fresh ingredients and the convenience and accessibility of a neighborhood restaurant. Whether it’s a salad, panini, pasta or signature pizza, the utmost care is put into crafting the perfect made-from-scratch meal at a reasonable price. Arizona is now home to twelve Sauce locations, in Chandler, Gilbert, Mesa, Phoenix, Scottsdale and Tucson, each offering a hip, comfortable setting. For more information, visit www.saucepizzaandwine.com or find us on Facebook, Twitter or Instagram.